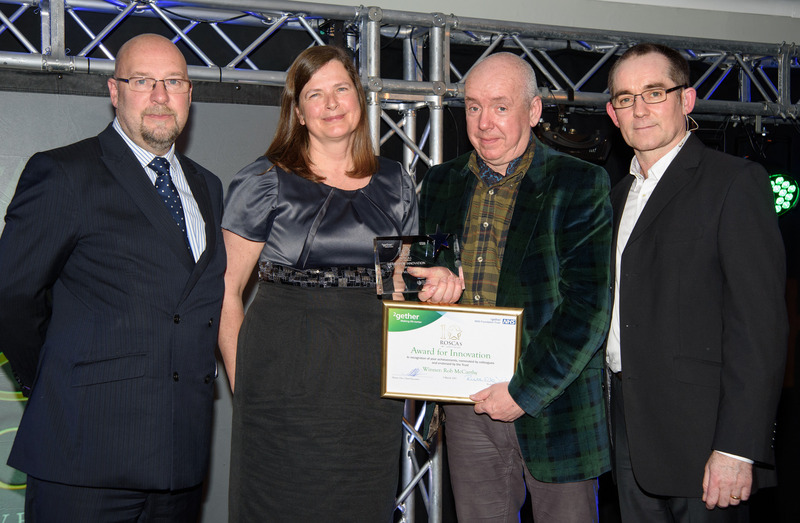 Congratulations to art psychotherapist Robin McCarthy who received an award for innovation at 2gether NHS Foundation Trust’s Recognising Outstanding Service Contribution Awards (ROSCAs). Rob’s award was sponsored by the West of England ASHN and presented by our Director of Quality, Anna Burhouse, who has a background in child and adolescent mental health. 2gether provides mental health and social care services in Herefordshire and Gloucestershire. In 2015, the community art therapist of the Herefordshire Psychotherapy team retired, leaving Rob as the sole remaining member. Rob consequently agreed to extend the hours he worked for the Trust and took the community art therapy service under his wing. Within weeks, Rob had redesigned the provision of the service, setting up a range of groups run from a hub. This resulted in a significant increase in access and activity in art therapy for clients across the county. The client is always at the forefront of Rob’s mind and, in partnership with reception staff; Rob even installed a Doodle Bar in the waiting room. Rob utilised his skills, energy and enthusiasm to refresh and redesign the group room, lobby and reception area at one trust site, after identifying that they had become tired and outdated. His design was driven by his huge sense for, and inclusion of, his clients. During this time, for health and safety reasons, a change had to be made to the windows of the building, which deeply distressed members of one art therapy group. Rob encouraged them to express this artistically and the expressive images were fed back to managers and senior staff. This is just one example of the clever way that Rob was able to convert a situation that could have led to setbacks in the recovery of clients, into one that increased both their trust and wellbeing. Despite having a heavy workload, Rob has also found the time to develop community links with the local art college and a strong collaborative relationship with the University of South Wales and their MA in Art Psychotherapy. This has enabled him to attract art therapy trainees to Herefordshire, who add to the local service provision. Rob explains: “I was deeply moved to be nominated, let alone win the award. “The past few years have been successful due to being part of a strong and supportive clinical psychology team, under the leadership of Damian Gardner.